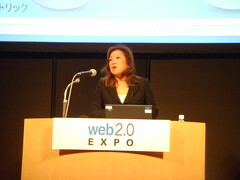 According to Yamanaka, Internet-based advertising can be classified into three categories: banners and rich media, list-type advertisements (which was the central topic of her presentation), and mobile advertising (i.e., a combination of banner and listings grouped onto the mobile platform). First of all, she talked about advertisement lists. Ad lists are usually quite accurate in terms of targetting since they are shown and ranked based on a degree of relevance. Internet-based ads (when compared with TV, radio, etc.) are growing exponentially. This increase is primarily being driven by ad lists and mobile ads. In yesterday’s first keynote speech with Joi Ito, the discussion mentioned that the focus has already shifted a lot towards internet advertising in the US, perhaps more so than Japan, but that this is now occuring in Japan too. She then talked about the difference between banners and ad lists. In the case of banner ads, what matters is the number of impressions, so the charge is based on CPM (cost per mille or thousand), and some people think of it as being very “Web 1.0”-like. However, ad lists, e.g., as shown in search results, are focussed more on CPC (cost per click), and are often associated with Web 2.0. Four trends (with associated challenges) are quite important and are being discussed in the field of Internet advertising: the first is increased traceability (one can track and keep a log of who did what); the next is behavioural or attribute targetting, which is now being implemented in a quite fully-fledged manner; third are APIs that are now entering the field of advertisement; and finally (although its not “Web 2.0”-related in a pure sense) is the integration between offline and online media, where the move to search for information online is becoming prevalent. With traceability, you can get a list of important keywords in searches that result in subsequent clicks. Search engine marketing can help to eliminate the loss of opportunities that may occur through missed clicks. Behavioural targetting, based on a user’s history of search, can give advertisers a lot of useful information. One can use, for example, information on gender (i.e., static details) or location (i.e., dynamic details, perhaps from an IP address) for attribute-based targetting. This also provides personalised communication with the users, and one can then deploy very flexible products based on this. Yahoo! Japan recently announced details of attribute-based advertising for their search which combines an analysis of the log histories of users and advertisers. As in yesterday’s talk about Salesforce working with Google, APIs for advertising should be combined with core business flows, especially when a company provides many products, e.g. Amazon.com or travel services. For a large online retailer, you could have some logic that will match a keyword to the current inventory, and the system should hide certain keywords if associated items are not in stock. This is also important in the hospitality sector, where for example there should be a change in the price of a product when it goes past a best-before time or date (e.g., hotel rooms drop in price after 9 PM). With an API, one can provide very optimised ads that cannot be created on-the-fly by humans. Advertisers can take a scientific approach to dynamically improve offerings in terms of cost and sales. Matching online information to offline ads, while not directly related to Web 2.0, is important too. If one looks at TV campaigns, one can analyse information about how advertising the URL for a particular brand can lead to the associated website. Some people may only visit a site after seeing an offline advertisement, so there could be a distinct message sent to these types of users. In terms of metrics, traditionally internet-based ads have been classified in terms of what you want to achieve. In cases where banners are the main avenue required by advertisiers, CPM is important (if advertising a film, for example, the volume of ads displayed is important). On the other hand, if you actually want to get your full web page up on the screen, ranking and CPC is important, so the fields of SEO and SEM come into play. Ms. Yamanaka then talked about CPA (cost per acquisition), i.e., how much it costs to acquire a customer. The greatest challenge in the world of advertising is figuring out how much [extra] a company makes as a result of advertising (based on what form of campaign is used). If one can try and figure out a way to link sales to ads, e.g., through internet conversion where a person moves onwards from an ad and makes a purchase), then one can get a measure of the CPA. For companies who are not doing business on the Web, its hard to link a sale to an ad (e.g., if someone wants to buy a Lexus, and reads reference material on the Web, he or she may then go off and buy a BMW without any traceable link). On the Web, can get a traceable link from an ad impression to an eventual deal or transaction (through clicking on something, browsing, getting a lead, and finding a prospect). She explained that we have to understand why we are inviting customers who watch TV onto the Web: is it for government information, selling products, etc. The purpose of a 30-second advert may actually be to guide someone to a website where they will read stuff online for more than five minutes. With tracebility, one can compare targetted results and what a customer did depending on whether they came from an offline reference (she didn’t say it but I presume through a unique URL) or directly online. Web 2.0 is about personalisation, and targeting internet-based ads towards segmented usergroups is also important (e.g., using mobile or PC-based social network advertising for female teens in Tokyo; for salarymen travelling between Tokyo and Osaka, it may be better to use ad lists or SMS advertising on mobiles or some other format; and for people at home, it may be appropriate to have a TV ad at a key time at night where there’s a high probability of them going and carrying out a web search for the associated product), and so there’s a need to find the best format and media. She again talked about creating better synergies between offline and online marketing (e.g., between a TV-based ad and an internet-based ad). If a TV ad shows a web address, it can result in nearly 2.5 times more accesses than can be directly obtained via the Internet (depending on the type of products being advertised), so one can attract a lot more people to a website in this way. Combining TV and magazines, advertisers can prod / nudge / guide customers to visit their websites. There is still a lot of room for improvement in determining how exactly to guide people to the Web. It depends on what a customer should get from a company, as this will determine the type of information to be sent over the Web and whether giving a good user experience is important (since you don’t want to betray the expectation of users and what they are looking for). Those in charge of brands for websites need to understand how people are getting to a particular web page as there are so many different entry points to a site. Ms. Yamanaka referenced an interesting report from comScore about those who pre-shop on the Web spending more in a store. These pre-shoppers spend 41% more in a real store if they have seen internet-based ads for a product (and for every $1 these people spent online, they would spend an incremental $6 in-store). There’s also a paradigm shift occuring in terms of ubiquitous computing, which is already a common phenomenon here in Japan. At the end of her presentation, she also referenced something called “closed-loop marketing” which I didn’t really get. But I did learn quite a bit about online advertising from this talk.